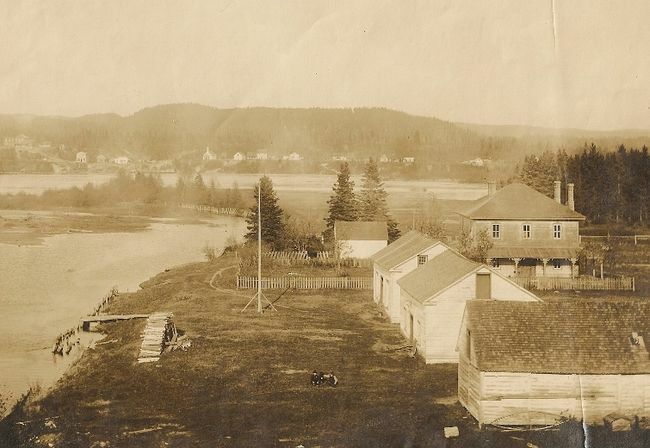 The trading post at the mouth of the Michipicoten River was the administration and supply for the entire Lake Superior District. Fur trading here initiated in the early 1700's and by the last part of that century the control of the area had changed from the French through the independent traders to the Northwest Company and finally to the Hudson's Bay Company. Michipicoten administered outposts, supplies and resources for posts located at Pic, Long Lake, Red Rock, Lake Nipigon and Fort William. Outposts of Michipicoten were also operated at both Batchawana and Agawa Bay. The Michipicoten post managed to maintain revenue through ingenuity and opportunity. Commercial fishing, boat-building, and tin-smithing were just some of the diverse activities which kept the commerce of the post humming. Just as the Hudson's Bay Company made plans to finally close up shop, a Michipicoten gold boom erupted. In 1898 the post became the first mining division office in Ontario and happily greeted and supplied the hordes of fortune-seeking prospectors who swarmed this remote corner of the country. Like so many booms, the bust quickly followed. In 1904 operations at the Michipicoten post were officially closed. 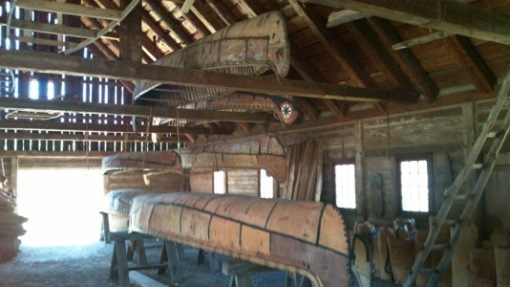 "The wood is an offcut from the timberframe structure of an HBC provision store (food storage for canoe and boatmen) erected at the Michipicoten post near Wawa on Lake Superior. The frame was originally erected at Michipicoten in the 1850s. Over the following century and a half, it had been reassembled more than once. Its origins were eventually forgotten and it was slated for destruction in the 1990s. 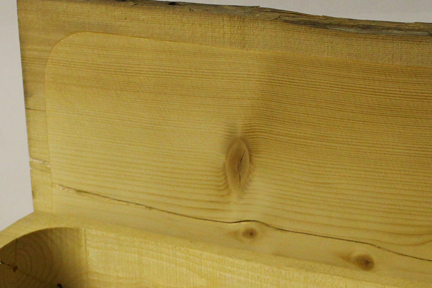 The demolition team saw the hewing and pitsaw markings on the timbers and, thankfully, enquired of its origins. The structure was disassembled carefully and set aside. Through financial support from the HBC Historical Foundation, our museum was fortunate to acquire the frame and have it erected within our museum, where it defines the physical space of our "The Land Becomes Canada" exhibit." 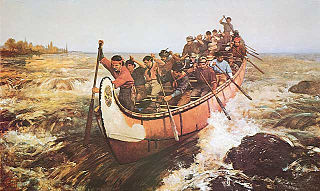 I was approached by a supporter of the Canadian Canoe Museum to donate a piece to a fund raising auction for the museum. I am often asked to give some of my work to this charity and that. 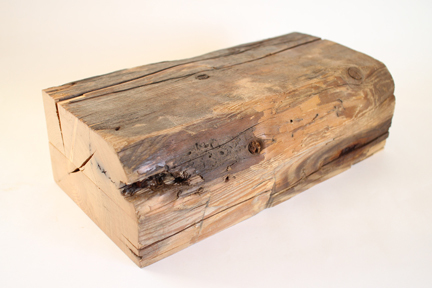 For the most part I say no but some get through when they respond to my proposal: Send me some wood that has a story that relates to your organization or that has some kind of history to it. (For more on how I feel about donating, please visit my blog, here.) 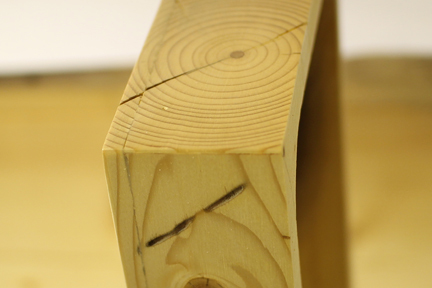 The Canadian Canoe Museum sent me a section of wood that is described above. I took the best the wood had to offer and made the bowl on the right. For History in the Making I was trying to get something from the leftover wood. What makes the story interesting and exciting is having some of the original surface in the piece. The only original surfaces left are what is to be seen in the photo on the right. 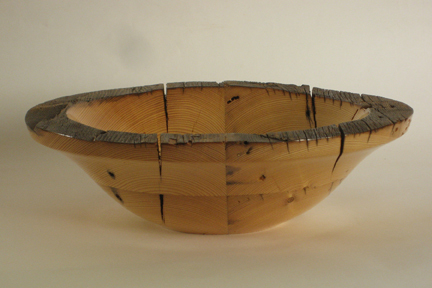 When I cut the remaining wood for a bowl, I realized that I was not going to show any external surfaces. 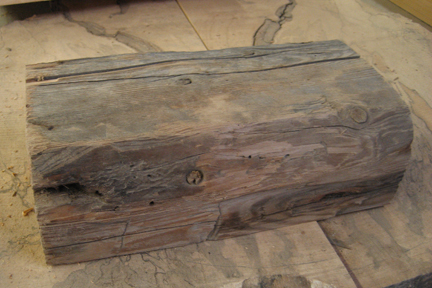 The far right image shows the wood sawn in half, lengthwise, and, although book matched, the original surfaces are on the bottom and sides. I cannot achieve the rim texture as I did in the bowl for the Canoe Museum. I made a sharp right turn in my thinking and decided to make a bandsawn box. 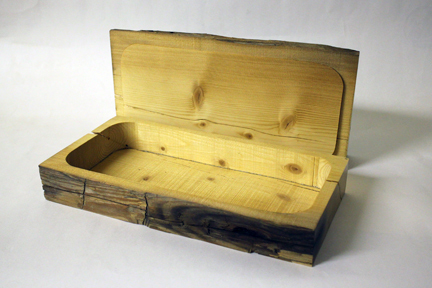 The box could be used for small items such as jewelry. This allowed me to keep the whole piece. The outside dimensions are 12" long by 6" deep by 3 3/4" tall. I started by cutting a 1/4" slice off the bottom of the lower piece. I then had the bottom piece, the middle piece and the lid. 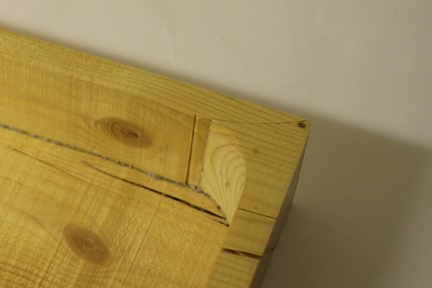 Next I drew a rough pattern on the top of the middle piece - this is what I was going to cut out to make the box. In order to cut out the center it is necessary to pass through one side of the box. This can look messy or it can be finessed. From above, it is easy to see the cut but when the box is closed the cut should be invisible. In order to make the cut disappear on the outside I cut in right at the corner. 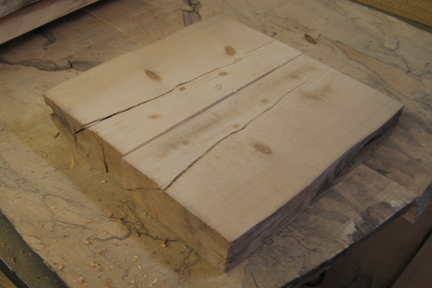 After the inside was taken out, the cut through the side was glued up to re-establish the integrity of the perimeter of the box. As you can see in the image on the right, the cut through the corner is virtually invisible. After the inside is removed, the bottom piece is re-attached to the middle piece forming the bottom section of the box. 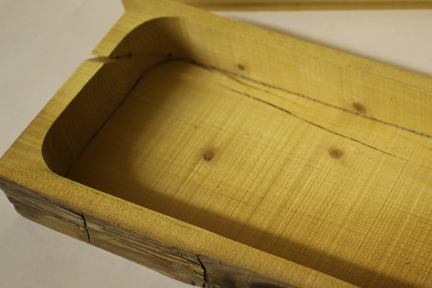 The inside of the box, the sides and bottom, are rough sawn. To make it practical for jewelry or other items such as hankerchiefs, it needs to be lined. I am going to flock the insides of the box with a green felt. In order to keep the lid from sliding off I cut a thin slice, about 3/16", from the waste from the inside of the box. I glued this to the lid so that it sits perfectly on the bottom section with just a little play. 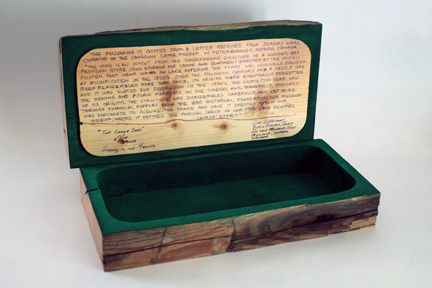 In order to keep the outside of the box as plain as possible, the story of the interesting piece of wood will be written on the inside part of the lid. Here is the completed box with its story. With the addition of the felt flocking, the lid fits snugger and doesn't slide around. I decided to call it "The Canoe Shed". This piece is for sale. If you are interested, please go to the price page for more information.